When an exterior-rated modular LED projector system with 500,000 options and a delivery lead time of no more than two weeks is launched, then I was keen to take a closer look. The system is RISE and is the latest offering from US manufacturer EcoSense. EcoSense is a Los Angeles-based company started in 2009 by the founders of Color Kinetics, George Mueller and Ihor Lys. They met at Carnegie Mellon University while studying for PhDs and went on to build the company into a leading player in the LED lighting market before selling to Philips in 2007. Their patent portfolio includes 50 patents covering a variety of LED technologies including Power Core, the combination of a power supply and control system for LED lighting. The EcoSense design team has taken a radical approach to the detail design of the RISE projectors, which enables users to change the optics on site while maintaining the IP rating. At the core of each RISE projector luminaire is a light engine comprising a single Cree high power LED driven by a digital mains voltage driver and fitted with a five-degree custom-designed lens. This light engine can be run at up to eleven watts, is sealed to an IP 68 rating and can deliver up to 700 lumens with more than 40,000 centre beam candelas. In addition to the single module luminaire, there is a quad version with four light engines in one housing. This luminaire produces 2,800 lumens with over 168,000 centre beam candelas, which is outstanding for such a small form factor. Unusually, the light engine is a separate module, with the driver mounted behind the LED board that is then fixed into the body casting. Transfer of heat from the aluminium LED pcb, via a separate die cast heat sink to the outer body casting, is achieved by direct metal to metal contact between the two castings. This configuration creates a very small form factor that apparently achieves such good thermal management that a maximum ambient temperature of 50-degrees celsius continuous use rating is specified. The RISE range offers a very wide array of light distributions and these are produced by fitting a secondary optic in front of the standard five-degree lens in the light engine. These secondary optics ensure that the lit effect produced is extremely smooth, although there must be additional light losses caused by these additional lenses/diffusers. To fit or change the secondary optics on site, two very long screws are loosened from the back of the luminaire body, allowing the front casting to be removed. The IP66 rating is achieved by soft silicone rubber seals between the back of the secondary optics and the primary lens. The secondary optic is clamped in place with a single central screw fixing, thus compressing the gaskets. This detail leads to the most surprising aspect of the design, as water is allowed to run through the luminaire while apparently maintaining the IP66 rating. The rationale for this is that it allows add-on optics to be changed in a foolproof way that does not compromise the IP rating. The front casting has built-in recesses so that the secondary optics are set back by around seven millimetres. It is understood that this detail gives improved glare and beam control. If water was allowed to build up in these recesses when the luminaire was pointed above the horizontal then it would lead to a variety of problems over time. However, channels are incorporated in the front casting allowing water to drain away from the recesses and into the luminaire body. In the sample I examined, these water channels were quite small and might tend to clog up over time with debris, but these have been increased in size in the final version. Once water has entered the luminaire body it then passes through and exits via the two fixing screw locations and the split line between the body and the rear end cap casting. One of the most successful design details is the double action Macro Lock mechanism. This locks movement in both horizontal and vertical axes with a single screw thus simplifying and reducing the time needed for aiming. 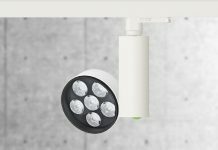 The designers have developed the RISE range so that individual RISE luminaires can be mounted together to produce multiples each with different optics aimed independently. 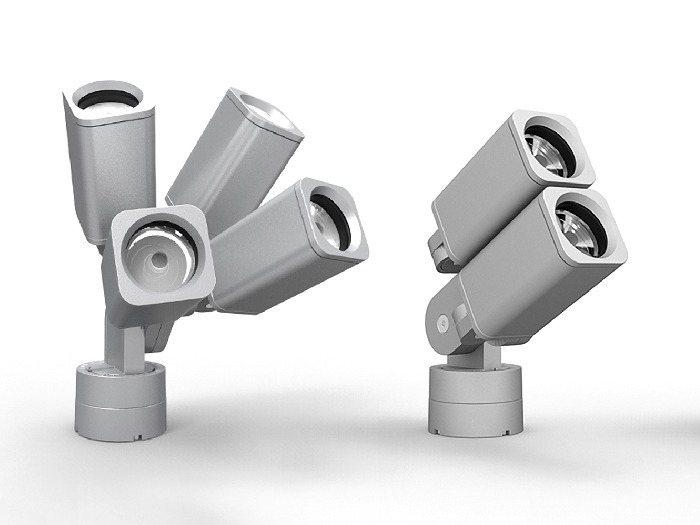 The singles and quad versions can be combined on the same mounting brackets to achieve very high lumen outputs. When each luminaire is aimed in a different direction the visual effect is somewhat reminiscent of Pixar’s animated robot Wall-E, but as a lighting tool there is nothing else on the market that comes close in terms of flexibility and output. It is understood that the RISE range was designed in-house from the ground-up at EcoSense with Robert Fletcher as Lead Designer and influenced by Mark Reynoso, Paul Pickard, Cristina Rodrigues, Mustafa Homsi, Jason Kim, Jacob Hawkins, Sana Ashraf, Andy Stangeland and Elizabeth Rodgers. The ultra short two-week delivery lead time for orders in North America is possible due to the highly modular nature of the design and the assembly location just across the border in Mexico. RISE is a remarkable piece of design and incorporates some details that would make me a bit nervous but clearly a great deal of engineering resource has been invested in its development, which should ensure a long working life without issues. 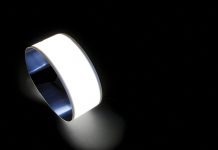 Due to restrictions between Color Kinetics and EcoSense it is understood that no colour changing LED versions can be offered for a period of time. Fixed colour dichroic filters are available, which do provide a good selection, but the efficiency is quite low for some colours, notably blue. The high lumen output, small size, flexibility and wide range of optics, including the very narrow five-degree primary lens of RISE should allow the range to be frequently specified and commercially successful. 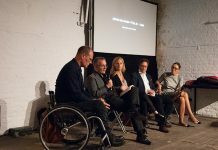 David Morgan runs David Morgan Associates, a London-based international design consultancy, specialising in luminaire design and development, and is also managing director of Radiant Architectural Lighting.